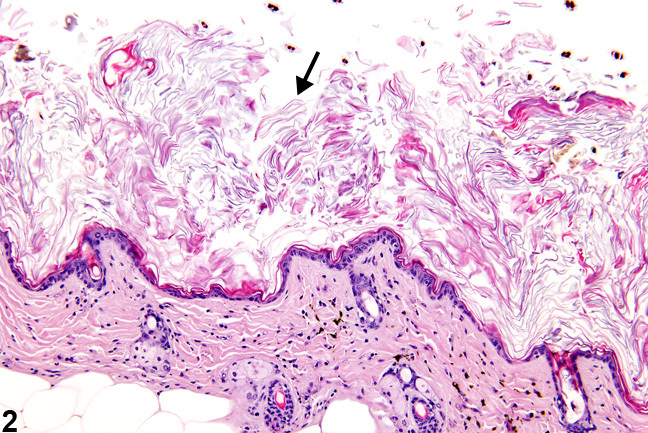 Hyperkeratosis-parakeratotic hyperkeratosis (arrow) in a male F344/N rat from a subchronic study. 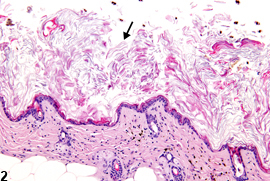 Hyperkeratosis-orthokeratotic hyperkeratosis (arrow) in a female B6C3F1 mouse from a chronic study. Hyperkeratosis is most commonly observed in dermal application studies and is often accompanied by or secondary to epithelial hyperplasia. It is characterized by thickening of the stratum corneum ( Figure 1 and Figure 2 ). 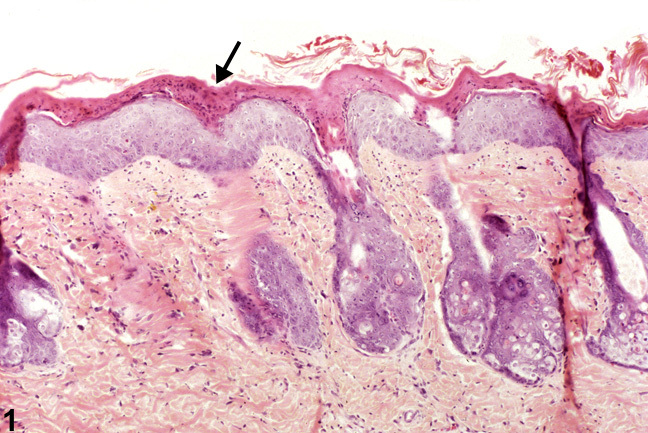 Hyperkeratosis is most commonly orthokeratotic (thickening of the cornified layer without retained nuclei; Figure 2 ). 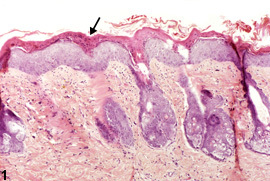 Parakeratotic hyperkeratosis, which is characterized by the presence of nuclei in the cornified layer, occurs rarely and is usually concurrent with epithelial hyperplasia ( Figure 1 ). Whenever present, hyperkeratosis should be recorded and assigned a severity grade. Since parakeratosis is simply a form of hyperkeratosis, only the term “hyperkeratosis” should be used in NTP studies. However, the hyperkeratosis should be described in the pathology narrative as being orthokeratotic or parakeratotic. Associated lesions, such as epithelial hyperplasia and inflammation, should be diagnosed separately.